Students have gathered on the streets of the French capital to protests against police violence. Smoke bombs and firecrackers have reportedly been thrown from the crowd of demonstrators. The majority of the protesters are students from Henri-Bergson College in Paris, RT correspondent Jonathan Moadab reports from the scene. The protesters violently attacked police station with firecrackers in northeastern Paris, RT’s local bureau reported. The majority of the protesters are students from Henri-Bergson College in Paris, an RT correspondent on the scene reports. The students are trying to block the local police station, and police officers are at the scene. 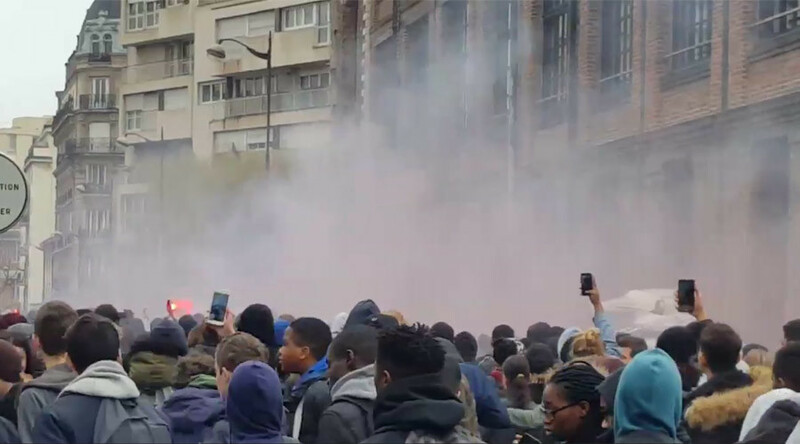 The protest comes following reports that a high school student allegedly from Bergson College was beaten by several police officers during anti-labor protest in Paris on Thursday. The video of the attack emerged on YouTube on Thursday evening. Police said they are analyzing the video and have launched an investigation into the case.